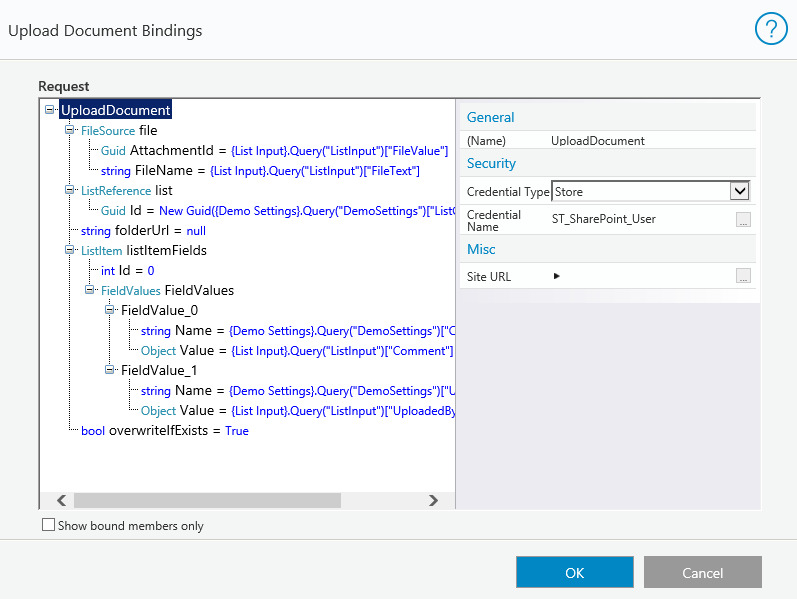 IMPORTANT: The SharePoint library type must be document library. The file that you want to upload to SharePoint. AttachmentID: Enter the attachment ID or click ... to make it the result of an expression. Filename: Enter the file name or click ... to make it the result of an expression. Content: Define from a Data source, or enter the Value manually or as the result of an expression. Filename: Enter the Filename or click ... to make it the result of an expression. (Optional) Define the file by selecting it from a DataSource or entering the Value manually or clicking the ellipsis button to set it as the result of an expression. (Optional) If you are uploading to a list folder, enter the list folder URL or click the ellipsis button to set it as the result of an expression. (Optional) Define the list item fields by selecting it from a DataSource or entering the Value manually or clicking the ellipsis button to set it as the result of an expression. Enter True or False, or click the ellipsis button to set the value as the result of an expression. If True, the document will overwrite an existing document with the same name. If False, an existing document with the same name will not be overwritten. Since folders in the SharePoint site can have different permissions than the hosting site, security credentials must be set in this screen, in addition to the activity's connection settings. To set the credentials, select UploadDocument and ensure that the Credential Type is not None. 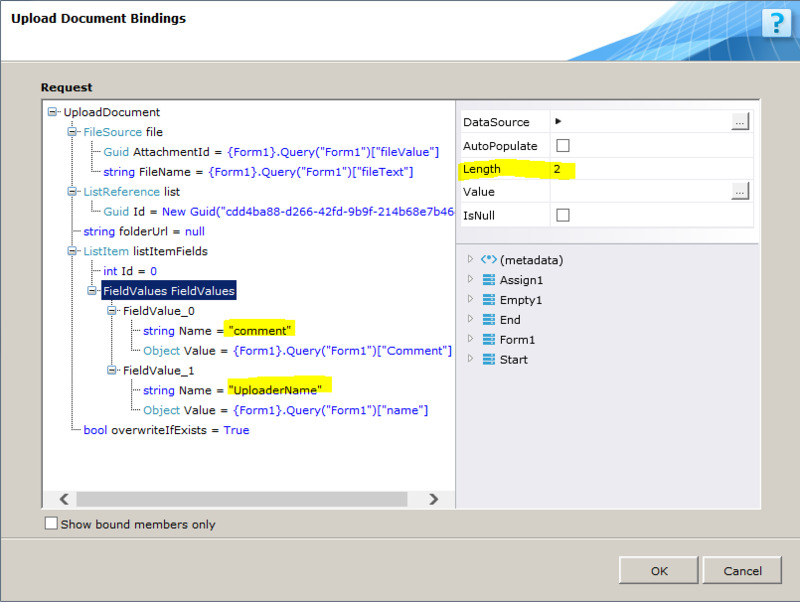 Verify that the column exists in the SharePoint list. In the Upload Document bindings page, select FieldValues and set the Length property to the count of the columns you want to update. Name: the InternalName of the field. You can use the SHP client browser tool to find this name. This parameter is case sensitive. Value: the object tree or the three dot button. The datasource field should be empty.